A steak pie is a traditional meat pie served in Britain. It is made from stewing steak and beef gravy, enclosed in a pastry shell. Sometimes mixed vegetables are included in the filling. Steak pie is subtly different from Steak and kidney pie. Left: Steak pie and peas. In Ireland Guinness Stout is added along with bacon and onions. It is commonly referred to as a Steak and Guinness Pie (or Guinness Pie for short). The dish is often served with "steak chips" (thickly sliced potatoes fried, sometimes fried in beef dripping). Steak Pies are also available from chip shops, served with normal chips, referred to in Scotland as a steak pie supper. 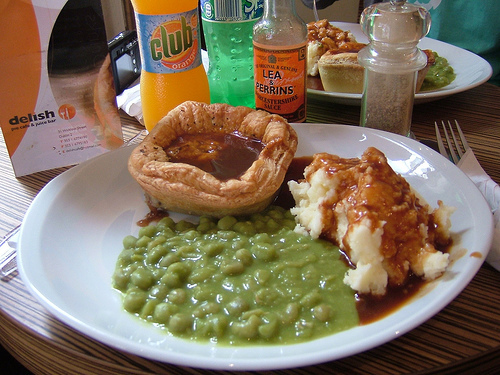 A steak pie supper is usually accompanied by salt and vinegar, however around Edinburgh a combination of spirit vinegar and brown sauce, known simply as "sauce" or "chippie sauce", is popular. The precise proportions of each ingredient are unique to each take-away. Other types of steak pie are available around the world, including in Australia and New Zealand (see Australian and New Zealand meat pie).